It’s Payday, folks! Greetings from Chattanooga, Tennessee, the Pittsburgh of the South! This Lunch Pail goes out to workers at the Sarasota Herald Standard who voted yesterday 22 to 16 to unionize, making them the second unionized newsroom in Florida. In the past week, Payday picked up three dues-paying readers: DC Progressive Communicators Network’s Patricia Brooks, Cleveland native Todd Smith, and Milwaukee Magazine Editor Erik Gunn. With two weeks in the month to go, Payday is 13 readers short of our goal this month. 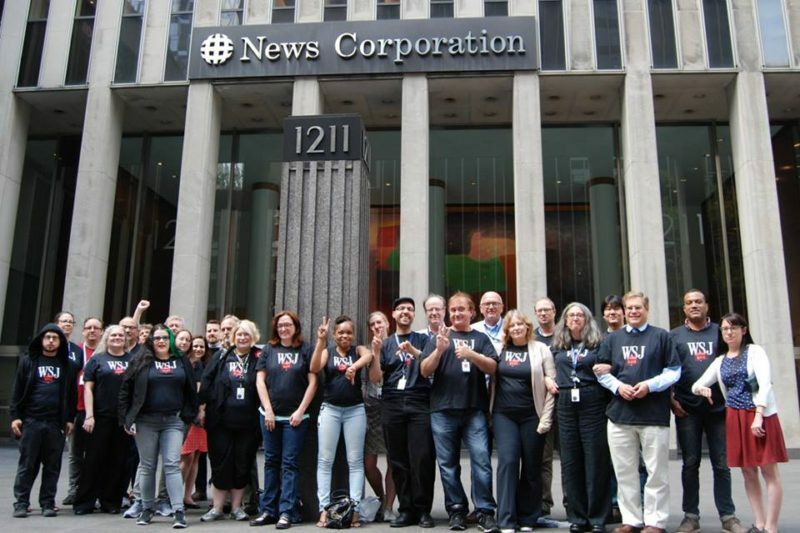 Join today and help us to continue to provide great labor reporting. Sign up here. After a new report by the Census Bureau showed that median household income grew by 5.2% between 2014 and 2015, the Wall Street Journal dug into data from the Bureau’s latest American Community Survey. It found that 7 of the top 15 cities for growth in median household income were in the South. The top three were Nashville, Birmingham, and Atlanta. The Obama administration’s new rule on overtime is perhaps its action most beneficial for workers. The new rule would raise the threshold under which salaried workers could receive overtime pay from $23,600 to $47,476, and index this amount to inflation. According to the Economic Policy Institute, 12.5 million workers would immediately and directly benefit from this change, most of whom would be newly eligible for overtime pay. If Schrader’s bill passes and the indexation provision is stripped, more than 10 million fewer salaried workers could be covered over the next 20 years. Inflation and wage growth would eat away at the number of eligible workers, which would drop from a share of 32.7 percent in 2016 to just 16 percent in 2035. “The guts of DOL’s rule is the indexation of the salary test for exemption. If it isn’t indexed it immediately loses its value and protects fewer workers, quickly becoming meaningless, as the current $23,660 level is today,” says Ross Eisenbrey, vice president of the Economic Policy Institute and the original proponent of the overtime rule. This week, indigenous communities and their allies won a major victory when the federal government decided to halt construction of the Dakota Access Pipeline. The victory came after weeks of occupying the land proposed for the pipeline by thousands of activists, attracting public support from all over the world. While some unions such as the Amalgamated Transit Union have come out against the pipeline, the building trades, who will be building it, have come out in favor of it. Last week, we reported that power company Dominion Resources, Inc. had locked out about 950 workers, one of the largest of such actions this year. On Wednesday, the company and the union, United Gas Workers Union Local 69, issued a joint statement announcing the end of the lockout. A temporary agreement has been negotiated that will last until April 1, and negotiations for a longer-term contract are set to begin in just a few weeks. In May, Payday reported on the lockout of approximately 380 UAW members at Honeywell plants in Indiana and New York that make wheels for F-35 fighter jets. The lockout has now dragged on for four months and it does not appear to workers like there is any end in sight. In a letter to Honeywell CEO Dave Cote written on September 9th, Senator Chuck Schumer (D-NY), Senator Kirsten Gillibrand (D-NY), and Senator Joe Donnelly (D-IN) call on Cote to end the lockout. Workers are also continuing to demand an end to the lockout. This week, the UAW released a video documenting these voices – watch it here. 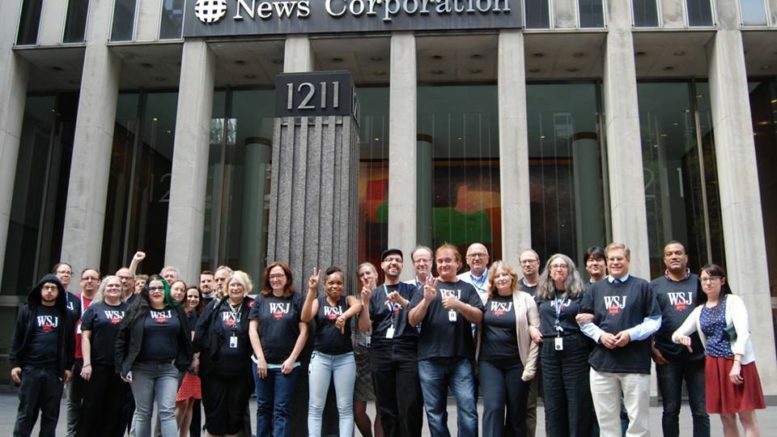 This week, hundreds of Wall Street Journal reporters engaged in actions against the company as their union, the Independent Association of Publishers’ Employees Local 400, a division of NewsGuild, bargains this week with Dow Jones management. According to IAPE Local 400, Dow Jones made more than $8.3 billion in revenue in 2015. Despite, this the company is demanding that workers pay more for their health care. The company is refusing also to fix an overtime system that leads to many reporters working unpaid on the weekends without comp or overtime pay. [Dow Jones] representatives have painted the company’s turnaround as too weak to provide any benefits to us. They have suggested [Dow Jones]’s workforce is an assemblage of replaceable workers who should be grateful the company’s contract proposal isn’t worse. And rather than present a compensation package that rewards our contributions and brings us closer to parity with such better-paid competitors as the New York Times, they entered the room demanding an array of benefit cuts and reductions in job security, with no acknowledgement of the concessions the workforce already has made during [Dow Jones]’s struggles of the last 15 years. For the last decade, a coalition of employers working in conjunction with ALEC have passed laws at the state level across the country that would allow companies to opt out of worker compensation plans and create their own. The company-run worker compensation plans have long been criticized for being inadequate and failing to cover workers. As the “war on coal” rages on in Appalachia, WMMT public radio is the perfect source for perspective and context with its weekly “Coal Report”. This week, it looks at the National Academy of Science’s new report into the harmful effects of mountaintop removal in Kentucky and West Virginia. Also, our very own Folk Labor Ombudsman will travel to Chicago at the end September to participate in the Teamsters for a Democratic Union’s biennial convention. Check out a sneak peek of the song he wrote for the Teamsters United Slate that he will sing during the opening ceremonies entitled “Hoffa You Gotta Go”. Payday has been closely covering the race of Berniecrat Khristy Wilkinson, who won the primary for Chattanooga-area State Senate District 10, despite being out-fundraised $79k to $3k. Wilkinson, who is Secretary-Treasurer of a Chattanooga-area community-labor alliance, is a key figure in the fight to make sure that economic growth is shared equally in Chattanooga. With her coalition of union members, students, black lives matter activists, and suburban moderate Republicans turned off by Trump, Wilkinson has a shot at unseating State Senator and Morgan Stanley banker Todd Gardenhire. This week, Gardenhire is being accused by Wilkinson of releasing a push poll accusing her of being a “nihilist” who doesn’t share the Christian values of her district. Wilkinson, who grew up in a Christian family in Michigan, quickly rejected the charge. Long Island University Lockout Ends But Could Others Be on the Way? This week, a precedent-setting lockout at Long Island University ended, but many in labor worry that as universities become more and more market focused that lockouts like the one at Long Island University could become more common. Jacob Remes, a labor historian and a New York University professor, says that in the second part of the 20th century, education in the US slowly went from being seen as a sacred path towards creating American citizenship to being framed in a more instrumentalist way as a “good investment”. The combination of this with high university tuition means that we now have a clear market approach to the entire sector. Our friends over at the Bitter Southerner have a great long form out this week profiling Nashville resident Nathan Bell and his songs about the struggles of laid off white collar workers like himself. Check out the full story, which is Loomis’s 192nd post in his This Day in Labor History series. Public Radio East WTEB 89.3 also has a special radio documentary looking at the history of unions in Eastern North Carolina and their current struggles to rebuild unions in the state, which has the second lowest unionization rate in the country (after South Carolina) at 4.1%. Give it a listen here. Labor’s gripes with the Loi Travail are many: At the top of the list is a provision that undermines large-scale collective bargaining agreements. Nearly the entire French workforce is covered by these union-negotiated deals—enshrined into law under the Popular Front government of the 1930s. With few exceptions, before the latest reforms, company-level agreements could not include weaker standards than those within industry-wide agreements. However, the new law authorizes employers to reach deals that, for example, can force employees to work longer hours and receive less overtime compensation than what’s prescribed by their industry-wide agreements. For a company seeking to tap into the French labor market and shape job conditions to its liking—Amazon, for instance—the benefits are clear. Finally, a new study by Forensic psychologist Nathan Brooks and Dr Katarina Fritzon of Bond University and Dr. Simon Croom of the University of San Diego reveals that indeed one in five bosses is a psychopath. Thanks for reading this week’s Lunch Pail. If you haven’t already, go here to become a dues-paying reader to help us continue this work. After that, sign the petition to save the UMass Amherst Labor Center and follow alum-led Save the Labor Center on Facebook or Twitter. Send any tips on stories to tips@paydayreport.com. Mike Elk is the senior labor reporter at Payday Report and a member of the Washington-Baltimore NewsGuild. He previously served as senior labor reporter at POLITICO and at In These Times Magazine. Be the first to comment on "2nd Florida Newsroom Unionized – AFL-CIO Says No to #NODAPL – Undermining Obama’s Overtime Rules"